Ground vibration limits are typically set to prevent property damage. There is no one limit in use everywhere. Limits are often rooted in research conducted over decades. By design, they are typically over engineered to provide a safety factor. In some cases, limits may be expressed as a single value, for example 25 mm/sec (1.0 in/sec.) However, it is more likely that the limits will vary based on frequency. One very common set of recommended limits is derived from research conducted by the United States Bureau of Mines (USBM). The USBM closed in the 1990s due to budget cuts; however, the work it did in the five previous decades greatly increased our understanding of how blast vibrations affect structures. One such research resulted in a report entitled USBM RI 8507, “Structure Response and Damage Produced by Ground Vibration From Surface Mine Blasting.” It was from this report that the USBM recommended the frequency-based limiting criteria. Current research continues to support these findings. The basis for the frequency-based limits is the concept of structure response. 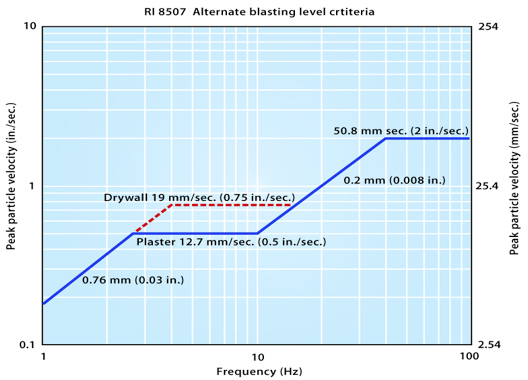 The recommended limits in RI 8507 are for the prevention of threshold cosmetic damage in the most susceptible of materials such as plaster and sheetrock. Other materials including masonry, concrete block and mass concrete can withstand much higher levels of vibration without damage.